Chocolarder was formed in 2012 when I decided that making chocolate might be a fun way to spend my days. Having dedicated several years to learning and working in commercial kitchens as a pastry chef, I began experimenting happily in my own kitchen, making small batches from raw beans and getting intimate with the processes of roasting, grinding and alchemizing to produce fine chocolate from scratch. My intention was to create a product based on the principles that have always been at the heart of great food – unadulterated sensory enjoyment without compromise. No shortcuts, preservatives, bulking agents, substitutions or artificial shenanigans. Just the real deal, right from the bean to the bar. This is a genuine commitment to ethical transparency that extends to every aspect of the business. We source direct from the farmers themselves – no easy feat given the distance, language barriers and logistics of getting the bulk of our raw ingredients across the world! But by establishing a direct channel from the farm to our kitchen, we can be picky about the quality of the beans and be sure that the money we pay for is going to those who do the real work. Having found reputable growers producing high quality beans, we commit to purchasing their harvest always for above the market prices. Transportation via sail ships is our solution to finding a viable low carbon solution. These boats load the cocoa from the farmers directly into their hold for a wind powered journey back to Falmouth, Cornwall. Here the beans are unloaded and brought to the workshop up the road. 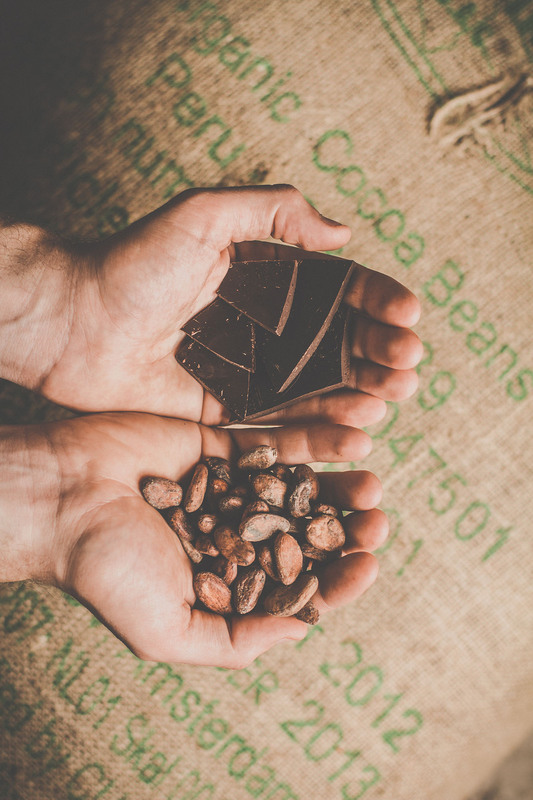 At Chocolarder, we suffer the privilege of having to sample a huge number of different cocoa beans and are consistently astounded by the diversity of flavour on offer. Eventually though we had to settle on some favourites. Criollo beans are generally held to be the best due to depth of flavour and the health benefits they have been proven to deliver. We use crops that are 100% organically grown and pesticide free. Raw cane sugar best compliments the flavor of cocoa. It has a lesser impact on blood sugar levels, and is easier for the body to digest than fully refined sugars. Sourcing our sugar close to the cocoa means we can get it all onto one boat. Like all good things, making chocolate shouldn’t be rushed. The chosen ones are slowly roasted, a process which ensures even roasting, moisture retention and a finer control over the ‘sweet spot’, ie. the point at which the flavour profile of the cocoa is at it’s peak. Beans are removed from their shells and stoneground to fine granules, then finer still into cocoa liquor. A stone melangeur, a giant stone wheel on a stone slab, crushes the sugar and cocoa particles until they are infinitesimal. The chocolate is then conched, and this is the true alchemy of the process. The chocolate is aerated and kneaded, particles are rounded and evenly distributed throughout the chocolate, acids dissipate, flavour compounds react and the chocolate’s character is brought to life. When the chocolate is finally ready, it is poured out of the conch to be matured in huge blocks for around 40 days to mature the flavour so that by the time you eat it, it simply couldn’t taste any better. Our packaging is not your average mass brand foil and paper affair. The box is a secure and pretty home for your bar, allowing you to safely store the bar in between tasting ensuring you don’t end up with a crumpled mess of paper and poil, and won’t affect the flavour of the chocolate, keeping it in prime condition. We have sourced recycled and recyclable material for the entirety of the packaging.